To me, paneer recipes give indulge taste. 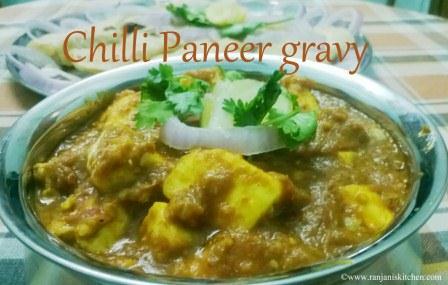 This chilli paneer gravy is an awesome combo for chappathi or naan. 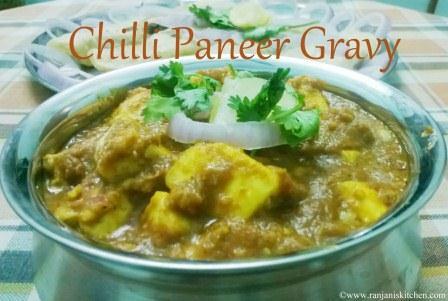 A mash up of paneer,onions, tomatoes, and spices taste wonderful.It takes very less time to prepare. I soaked paneer in hot water for some time before cooking. Which tastes very soft and exotic .Now off to the recipe. Slice the paneer into cubes and place it in warm water until we use. Grind big onions and tomatoes separately and keep aside. Heat the kadai, add 1 tbsp of butter, once it melts add 1tbsp of oil. Now add grinded onion and ginger garlic paste. Saute till the raw smell leaves. Then add the tomato puree, sauté till the oil separates. After that add red chilli powder, garam masala and turmeric.Give a quick stir. Then add ¾ cup of water, salt and sugar. Allow it to boil for some time. Once it comes to semi gravy consistency, add the paneer cubes, allow it to boil for 3 mins. Finally add milk,give a quick stir and switch off after one boil. Garnish with coriander leaves. 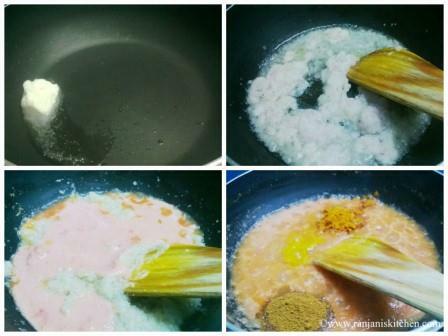 You can fry the paneer cubes in oil instead of soaking in hot water. Instead of milk,you can use fresh cream.